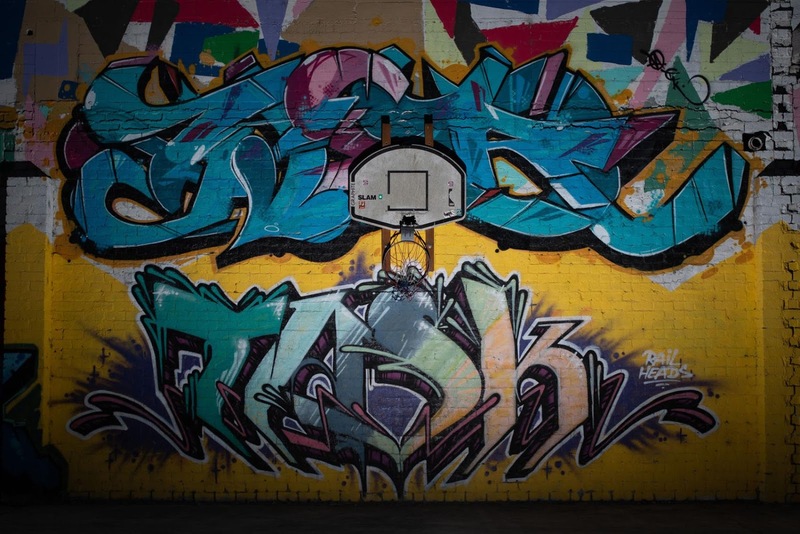 Graffiti surrounds a basketball hoop at a popular graffiti wall in Yakima. Two years ago, Sandino hosted an urban art show that brought in artists from around the country. Over the course of a day, the artists covered the wall with graffiti art. Those artists said the event was the biggest collaboration between artists they had ever seen. Instead of paying the artists, Sandino offered the backside of The Barrel so artists could freely practice their art at any time. He said the wall is redone about every six weeks. Since then he hasn’t had any problems with unwanted graffiti. “I don’t have to worry about street taggers coming in because there’s an unspoken rule that you don’t mess with other people’s art,” Sandino said. After the artists finished the wall, surrounding businesses got in on the trend and had art done on their buildings as well. Now, the buildings on Ranchrite Road serve as a sort of urban art gallery. Sandino, who also coaches for the Wine Country Crushers roller derby team that practices in The Barrel, said people from around the Valley have held photo shoots with the art as the background. The art has also earned mention in nationally circulated urban art magazines. He plans to invite artists back next year to paint over the existing art. Sandino admitted that the art style is not good for every location. He said it wouldn’t fit a professional medical location, but it fits well in the industrial area where his building is. The Barrel isn’t the only place to embrace the new trend. Graffiti art can be found behind Cost Less Carpet on Martin Luther King Boulevard, Jagz Barber Shop, Eves Garden and elsewhere. The large mural at the corner of Sixth Street and Lincoln Avenue is especially notable because it is the first piece of graffiti art commissioned by the city via the Yakima Police Department’s Gang Prevention Unit. In 2016, the city had taken some art from The Barrel and wrapped it around a utility box on the corner of 40th and Summitview avenues. The box is one of nine around town with the art. Trevor Braden, 31, is the artist for the piece commissioned by the police department. He has been creating graffiti art for years under the street name Tabs. Braden grew up in Toppenish, a city known for its murals, and discovered his love for art in elementary school. At 15, he used a spray can for the first time and started practicing legally. Four years ago, he started a business with his brother, Garrett Mesplie. Braden said he usually works on one mural a week. At any given time he could be working on two to three projects. He’s seen graffiti art rise in popularity over the past couple of years and said that can be attributed to the maturing of artists and a desire by artists to educate people about the art form. He said the rise could also be because people want to see different types of art in Yakima. Braden is one member of a larger community of urban artists creating graffiti art.